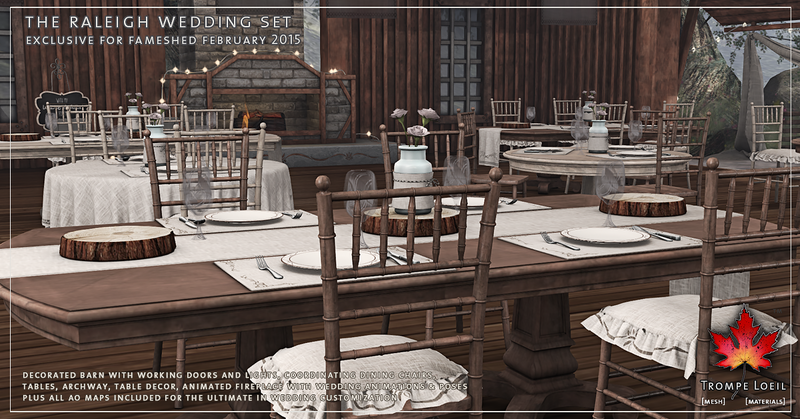 Its cold outside, but Valentine’s Day will be cozy with our first-ever wedding set, complete with beautiful country venue large enough to fit the entire celebration – the Raleigh Wedding Set, exclusively at the new dedicated FaMESHed region! 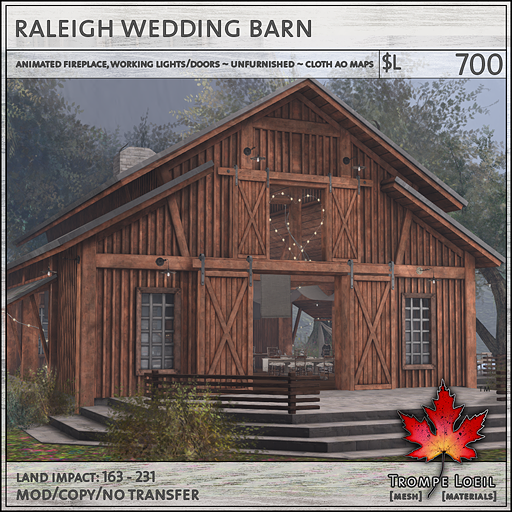 The centerpiece of the set is the Raleigh Barn – the main structure has a spacious 16x22m footprint, which can be expanded to 38x34m with the outdoor patios. 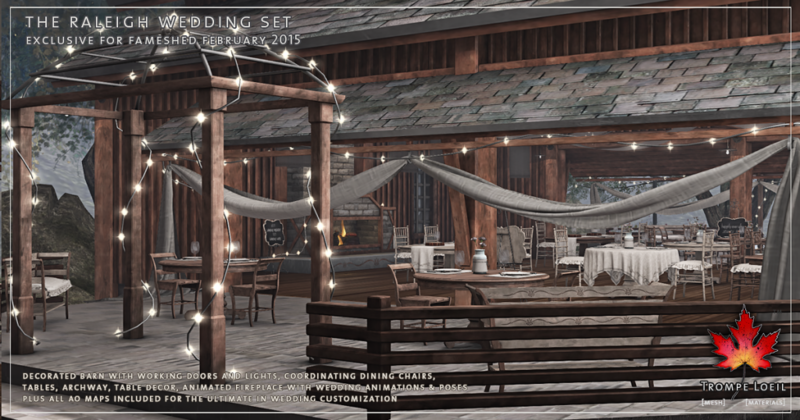 We’ve included several models depending on your decorating needs – with or without decorative cloth drapes, string lights, and patios. 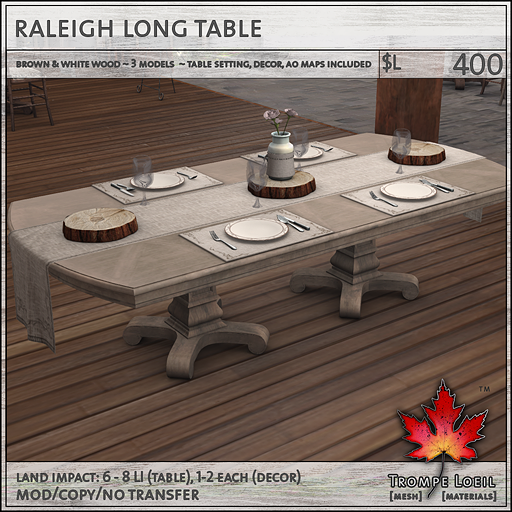 Plus, the cloth AO maps are included for easy customization for your color scheme! What really makes the build special is the animated fireplace, with proposal, ring exchange, vows, and dramatic kiss couples animations, plus a great selection of static wedding photo poses. 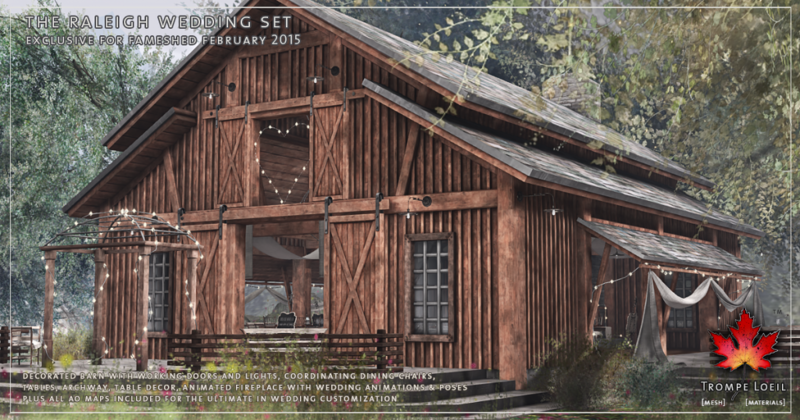 Scripted with our *home control system to control the included lights and sliding barn doors, this build is a fantastic general event centerpiece in general – or use it as an open-air studio home! 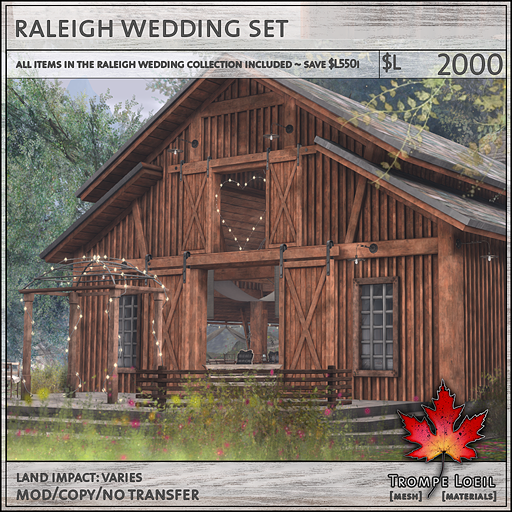 Grab the Raleigh Barn or pick up the entire Raleigh Wedding Set pack and save $L550 off the total cost! 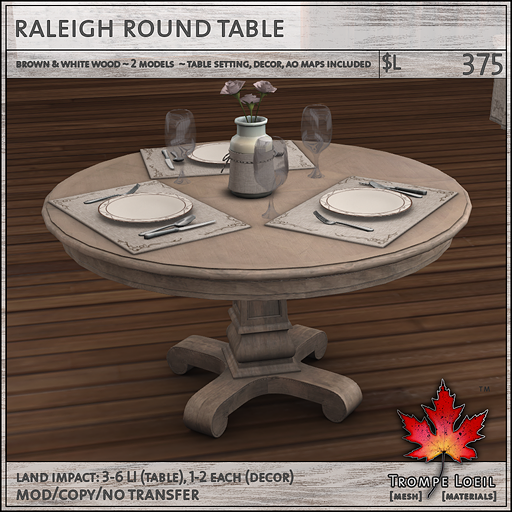 The Raleigh Tables (long or round) include two wood colors, multiple models, place settings, and rustic country centerpiece plus AO maps for easy customization. 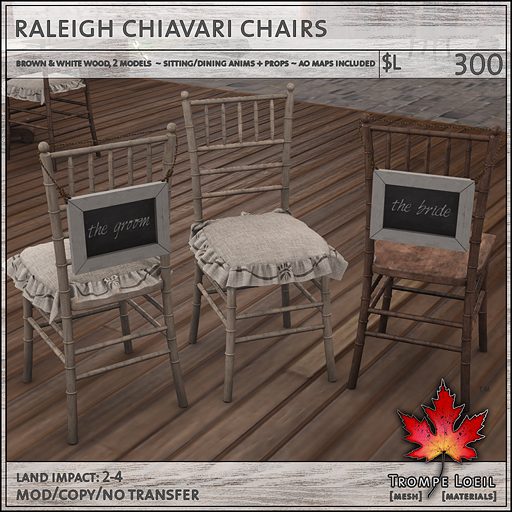 The matching Chiavari Chairs are made for use in the audience or at the dining table – we’ve included animations for both, plus dining props like flatwear and drink glasses, plus AO maps for all parts. Don’t forget to customize the included hanging signs! 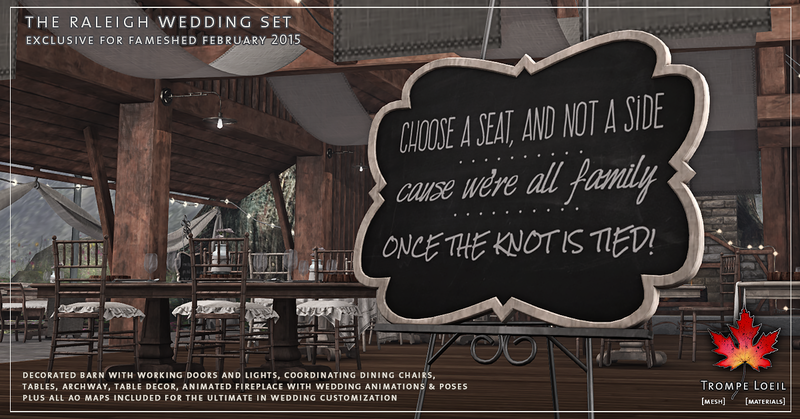 We’ve included ones for brides and grooms, but the included full permission chalkboard texture lets you easily use them for whatever you wish. 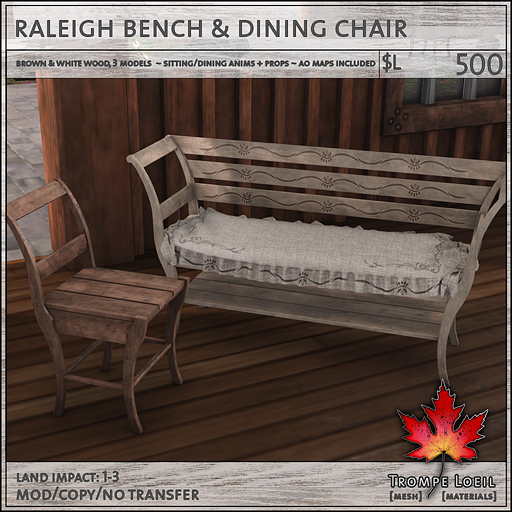 The Raleigh Bench is designed for singles or couples with PG animations, and the included Raleigh Chair features all the dining and audience animations plus props from the Chiavari Chairs – and again, AO maps are included for easy customization. 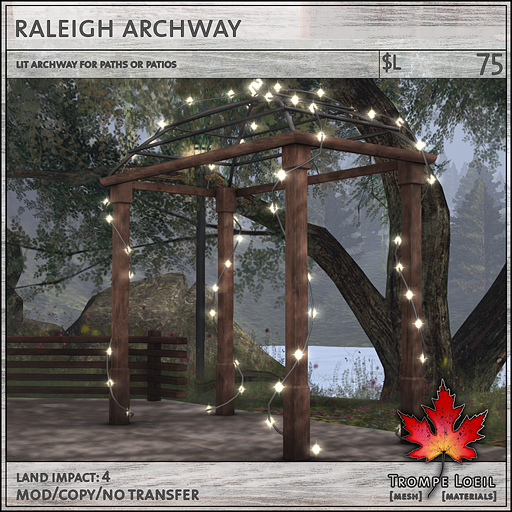 The Raleigh Archway is a lovely lit standalone accent piece for your pathway or in your garden. Finally, the Raleigh Chalkboard includes five wedding-themed designs, and we’ve included the chalkboard template texture as well for creating your own custom signs! 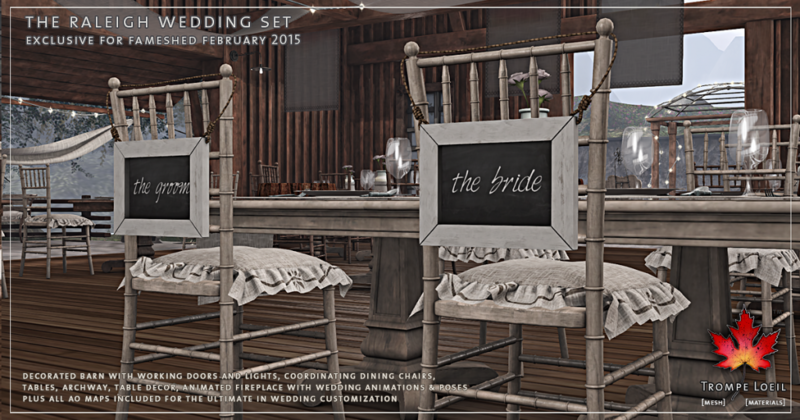 See the new Raleigh Wedding Set in person at FaMESHed’s new on-site home & garden display area, and pick up the entire set only at FaMESHed for the month of February!